Let's take a look at the new wearable devices for children and tweens that are the latest models in 2016. 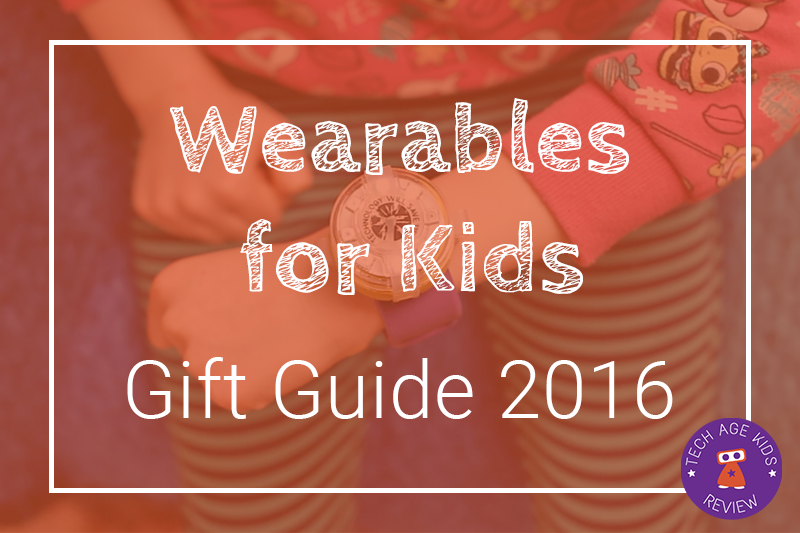 Kids wearables can be useful, motivational, and just plain fun. 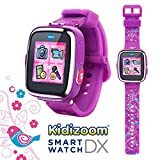 The KidiZoom SmartWatch DX is the current version of VTech's SmartWatch for kids. The KidiZoom SmartWatch has timer and stopwatch features, games and a built in camera which can also take videos. 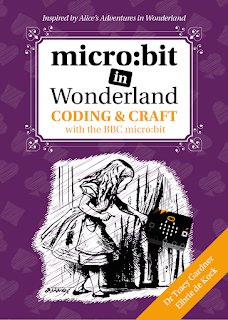 It's designed for children aged 4-9 and is a useful bit of kit for that age group. The DX (2nd generation) version adds a motion sensor which is used to provide a pedometer feature and motion-based games to encourage kids to get active. Look out for the special edition versions with an additional patterned wristband. 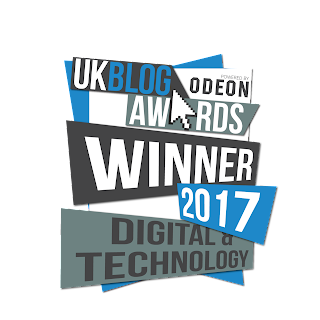 There are more sophisticated wristband designs available so the KidiZoom can look much more grown up that the first edition. The Garmin VivoFit Jr is a full-featured fitness tracker and chore/behaviour management device. It comes with a small wrist band designed for children aged 4-9 and can be used with larger wristbands for bigger kids. The VivoFit Jr has some really practical features. Kids can keep the VivoFit Jr on while swimming and it has a long-life battery which only needs to be replaced about once a year. The VivoFit Jr pairs with a kids app with a mobile adventure trail to unlock. Parents can monitor their kids activity and also assign chores and set rewards. The VivoFit Jr comes in some fab designs which will appeal to bigger kids. Off the shelf gadgets are great, but wouldn't it be brilliant if kids could make their own wearable? Well the Tech Will Save Us Mover Kit gives them that opportunity. 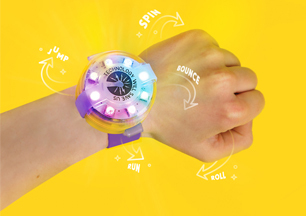 Kids aged 8+ can design and code their own wearables with the Mover Kit which has motion sensors and multi-colour LED lights. 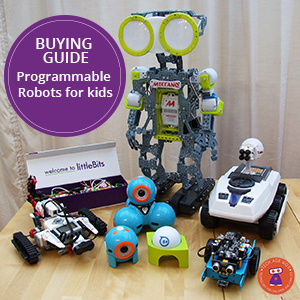 We think it's really important that kids understand how modern gadgets and devices work. Our kids are getting these for Christmas! The Mover Kit started out on Kickstarter and now it's available to pre-order. Sphero is a programmable spherical robot which is also available in a Star Wars BB-8 version complete with balancing head. The Force Band is a wearable that can be used to control the Sphero BB-8 (and other Sphero robots that use Bluetooth Smart) using gestures. This is a fun, futuristic gadget that will make kids feel like they have the force, and give them a taste of the future. 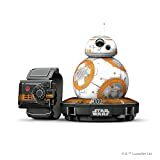 BTW Sphero BB-8 is programmable with the SPRK Lightning Lab coding app so it's a great option for combining fun entertaining tech with the option to learn lots too. The Pokemon Go Plus is a wearable companion gadget for Pokemon Go players. It means that kids don't have to walk around with their face in their phone all the time! The Pokemon Go Plus allows you to track steps walked to hatch eggs and collect buddy candy without having to have the app open all the time. The device also vibrates and lights up to let you know when there's a pokestop nearby. When there's a Pokemon that you've already caught nearby you get a chance to throw a pokeball without getting your phone out. 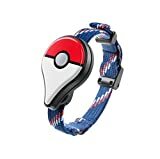 The Pokemon Go Plus comes with a wrist strap and can also be clipped on to clothing or a bag. It looks pretty cool. Kind of a wearable? The Viewmaster VR Headset allows kids to get in on the VR craze with a headset designed specifically for them. 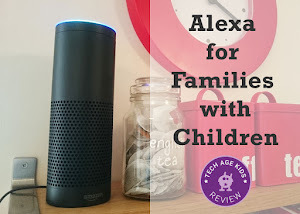 It's smaller than adult headsets and must be held rather than strapped on - we think this is much safer as it limits the weight on the neck and also limits the amount of time that can be spent using the device comfortably. The Viewmaster Deluxe VR Headset is an updated version which has a new design, better lenses and a headphone connector. The Viewmaster headset can be used with Viewmaster content and can also be used with Google Cardboard content. There's also the Viewmaster Labyrinth game which combines physical props with a VR game. Note that kids will need access to a compatible phone.